Hello all! I'm checking in today for Ready. Set. Write! My summer goals are posted here, if you missed my post last week. If you'd like to participate in Ready. Set. 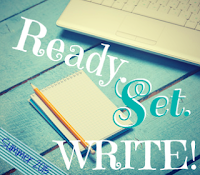 Write, you can find out more information on Jamie Morrow's blog. Below are my answers for the check-in questions. 1. How I did on last week's goals. Mediocre. I read a lot (especially submissions wise) and exercised, but revisions could have been better. Identify ALL my scenes so I can address what needs to stay and what needs to be cut. Read more Black Fox Literary Magazine submissions. Exercise at least 3 times. I honestly didn't revise as much as I wanted. And I'm really just identifying/analyzing scenes at the moment. 4. The biggest challenge(s) I faced this week. My protagonist. Even when I get frustrated with the story, she keeps speaking to me. She won't let me rest until I get her story right. I know what it's like to have characters speaking to you! With my current WIP, it's even stronger, since he was a real person, not just a figment of my imagination. Ugh. Time. It's so my enemy. Good luck on identifying your scenes. I'd like to know your process on how you figure that out. That's a good sign that your protagonist keeps you going. Revisions do drag at times, and here's to figuring it all out! Finding time is hard but you can do it! Good luck rewriting and revising this week and glad your protagonist is still chatty! Sounds like you have a fun protagonist. Wish mine were that talkative. Thanks for stopping by and for the words of encouragement, all!